Two row of rounds were planted in October 2017. They are now mature and produced about four cloves per round. These cloves will now be planted in October 2018 and will produce normal sized garlic bulbs in July of 2019. Sequence is plant bulbils (seeds), Rounds, Small bulbs, Then normal sized garlic. Bulbils>Rounds>Bulbs>Normal sized Garlic. The small bulbs were pulled and place in a warm spot in the shade in the greenhouse to dry for planting in October 2018. This sequence means the full garlic crop is used, not necessary to save some for planting , also the new garlic is disease free. 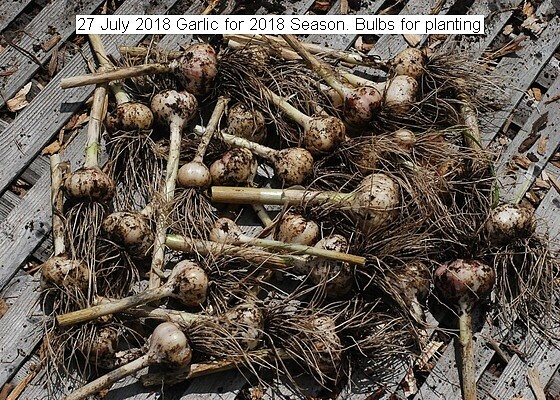 This entry was posted in Uncategorized and tagged 27 July 2018 Garlic for 2018 Planting Season, Mature bulbils. Bookmark the permalink.